New pictures of the LTTE media TV newsreader Isaipriya alive have emerged.The Sri Lanka Ministry of Defence claims 53 Division troops killed Isaipriya during the last battle. Her name is in the Ministry of Defence’s published list – “Identified LTTE leaders who were killed on 18 May 2009 by 53 Division troops“ – as “Lieutenant Colonel – Issei Piriya – Communications/Publicity Wing”. Isaipriya was taken into army custody on May 18, 2009. First pictures of her dead body emerged. Then on June 22, 2012 , Colombo Telegraph published pictures and a video which show the LTTE media TV announcer Issapriya’s naked body lies with the hundreds of dead bodies, but this time her hands are untied. The security forces officer speaking in Sinhala language to a female says, “here, here, Voice of Tiger announcer.” (Watch at 2.56mins in the video). When her dead body was photographed the first time , her hands were tied behind her back and allegedly raped. Exclusive – Warning Disturbing Images: Issapriya’s Naked Body With Tied And Untied Hands – Colombo Telegraph.The video clearly demonstrates a pattern of woeful consistency of the Sri Lankan forces. The President of Sri Lanka and his brother must be held responsible for the horrific treatment and murders of Isaipriya and her friend. They must be tried before the International Court of Justice and made to pay for thw war crimes that led to more than 100 000 Tamils being slaughtered by Sri Lankan soldiers in 2009. They cannot be allowed to go scot free. Narendra Modi, the Premier-elect of India, must enany sure that these two thugs are made to pay for their war crimes. They cannot be treated with dignity at any swearing in ceremony in New Delhi. Please see the big picture here than isolated cases like this. The Rajapakse government destroyed LTTE not for the sake of the country. Only to overcome their personal threat from LTTE. They escaped from several attempts of murdering. Those who come forward in any attack, they will win. Ultimately Rajapakse won and Praba defeated. This is the truth. But this is bitter to many. The truth of the matter is Prabha (VP) helped MR to win both presidential elections and the war. As unfortunate as this may seem I believe this unfortunate woman was fully aware of the dangers of going in to man’s war. There is no question that these are not the normal rules of engagement in war, but that is was not a normal war. It was fought with lot of hatred and that hatred still lingers between the two communities. If we can identify the culprits who did this, then certainly they should be tried and punished. However, to say the President should be tried as a war criminal based on these is a fallacy. If that is the case then most of the western leaders are war criminals as we have documented evidence of soldiers committing war crimes. Both the US and the UK governments have punished individuals when they could be clearly linked to the crime. Despite all these pictures, there is no proof against any specific individual. Rather than always denying these allegations Sri Lankan government should have at least tried to identify these individuals and ask those who publish these pictures to name individuals. Remember as gruesome as this may look Sri Lanka soldiers also risked their lives saving thousands of tamil civilians carrying women and children to safety. Such as this, there is photographic evidence for that as well. Therefore, this is not an indictment on the Sri Lankan army, but an accusation on a small group of individuals whole may have exceeded their authority. This has happened with every army and happens to this day in ongoing wars. Let’s get things in perspective and try to punish those who deserved to be punished. 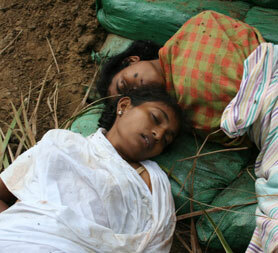 No sympathy for LTTE criminals who killed more Tamils than any others. Further this picture is not Isaipriya who was a Major in the LTTE army. So, she deserved to be killed by any one. She was reading NEWS how other Tamils killed by LTTE as traitors and so on. Army will kill enemies of the country. LTTE morons cannot be an exception. G.W.Bush killed thousands of Iraqis for nothing. The so called HR companies never cry at the bogus war and killing of Iraqis. What kind of yard sticks these HR companies use? Sanctions must created to encourage more change for the better where bad government allows civil rights abuse. Sorry! This is the law of the war ‘ kill or get killed’ Those who are going to war like heros should not expect sympathy from anyone. She was helping the publicity of terrorism. Those who showing sympathy for the terrorist not talk about the Human Rights of the innocent lives lost by them. who lost their parts of the bodies, limbs etc. ?